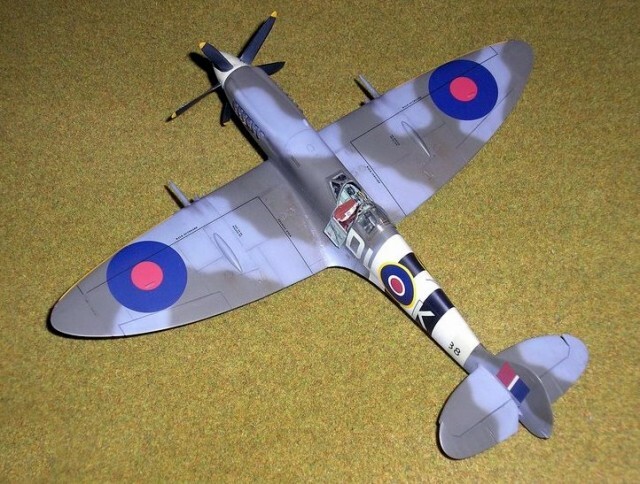 While Tamiya has deservedly attracted a huge response from Spitfire modellers for their superb 1/32nd Spitfire Mk.IX, the “pioneer” Mk.IX kit in this scale, by Pacific Coast Models has still much to offer. Being simpler, it is an easy basis for any conversions – and a less expensive one too!. Some six months ago I built the same early Mk. IX version as ZX-6 which is already displayed at this site, courtesy of Yrjo Knuuttila. Desert Camouflage is very appealing! I recently purchased a second PCM kit after being given an RB Productions resin after market conversion set for a Mk.XIV. I spent an enjoyable couple of months completing the project. The decals come from Zotz and they are excellent. Please keep up the great work – greetings to all from Sydney, Australia. Fantastic work and I must say that it really captures the beasty look of a Mk. XIV. Thanks for sharing! My friend Steve Bakke completed a MK XIV conversion just recently, also using the RB conversion set and the PCM kit. 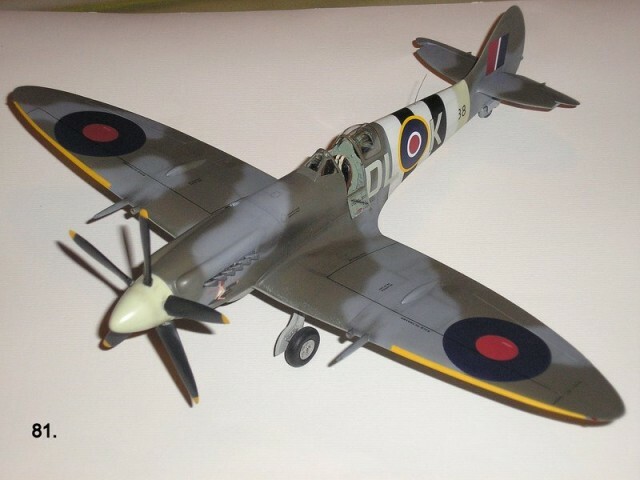 Steve robbed landing gear struts from the Tamiya Spitfire and used the new Barracudacals Resin wheels. Steve felt he may have had better luck had he combined the conversion with the 32nd scale Hasegawa kit instead. I know Steve had issues with warpage and alignment of the empennage but the end result looks good. He did the same scheme as well and used the Miracle Masks set to paint on most of the markings. Any experiences combining the conversion with the Hasegawa kit for comparison purposes? Thanks for your comments. 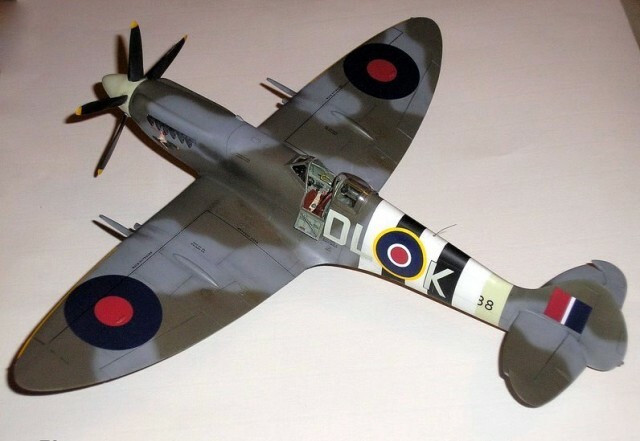 I built the Hasegawa Mk.V many years ago OOB. The only problem I recall was the very skinny prop blades. With the XIV I experienced a fair bit of shrinkage from the resin parts, so there’s lashings of filler on top & bottom of the nose cowl. U/C legs are scratchbuilt from brass tube & wheels are MasterCasters. Cannon & M/Gs are drilled out with brass tube muzzles PCM are to be congratulated as their kit is affordable enough to risk the odd mistake! Very nice Tony, has captured the MXIV look very well. Whose aircraft was that? I like the little doodle bug on the nose. Must have been an exciting sortie to go after one of those. Apologies for my slackness. Thanks for your kind comments. The Mk.XIV DL-K belonged to Flt.Lt. “Johnny” Johnson of No. 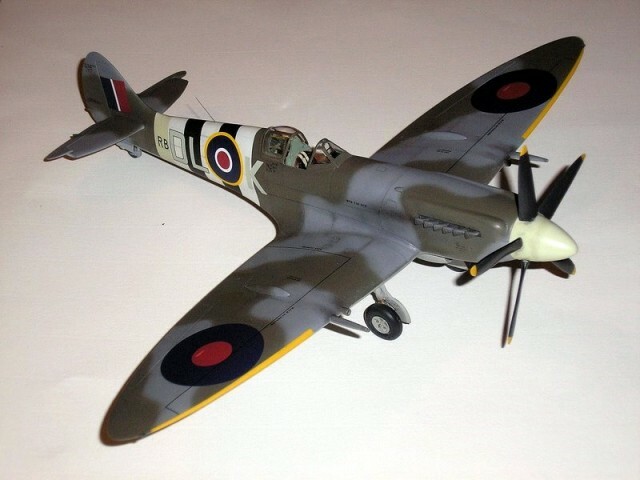 91 Sqn. based in West Malling during July 1944. The girl astride the Doodlebug on the nose is called “Brumhilda” & the decal sheet is from Zotz.